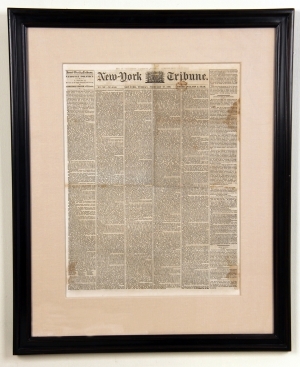 The price includes archival framing similar to that shown here—though a variety of other styles are available at no additional cost. Lincoln gave his speech at the Cooper Institute in New York City before he captured the Republican presidential nomination, and its success catapulted him to national attention as a viable presidential candidate. Using James Elliot’s The Debates in the Several State Conventions on the Adoption of the Federal Constitution, he delivered a speech that concentrated on the Founders’ original intent about the contentious issue of slavery. As in his “House Divided Speech” two years earlier, Lincoln used the occasion to differentiate his positions from those of the Democrats, who accused Republicans of being a sectional party, or of helping John Brown’s raid on Harpers Ferry, or threatened secession if Lincoln was elected. Lincoln begins by arguing that twenty-one of the thirty-nine Constitution signers believed that the federal government could ban slavery in the territories. He then explained the Republican position did not threaten slavery where it already existed, though he did insist on limiting slavery’s expansion into the territories. Unlike most of Lincoln’s important speeches, the Cooper Union address is neither short nor particularly quotable. Nevertheless, Lincoln the lawyer lays out his arguments, building to the unassailable conclusion that the Founding Fathers saw slavery as an institution that would wither and die with time and isolation. On the afternoon of the speech, Lincoln sat for a photographic portrait in Matthew Brady’s New York studio. He later reputedly said, “Brady and the Cooper Institute made me President.” Lincoln dined with supporters, and he then went to the New York Tribune offices to read and correct the typeset text of his speech. According to the young typesetter who worked with Lincoln that night, the manuscript was left on a table and then discarded. Later, on page 4, Tribune editor Horace Greeley comments in an editorial, “The Speech of Abraham Lincoln at the Cooper Institute last evening was one of the happiest and most convincing political arguments ever made in this City.” Greeley was so pleased that he rushed this edition into print, but also commented that “We shall print an extra edition of the Semi Weekly Tribune containing the speech ... We shall soon issue his speech of last night in pamphlet form.” The extra was printed later in the day on February 28; the pamphlet was printed March 6. As a result this is the first printing of Lincoln’s Cooper Institute Speech.